This post is for programmers coming to Go who are unfamiliar with the idea of pointers or a pointer type in Go. Simply put, a pointer is a value which points to the address of another. This is the textbook explanation, but if you’re coming from a language that doesn’t let you talk about address of a variable, it could very well be written in Cuneiform. 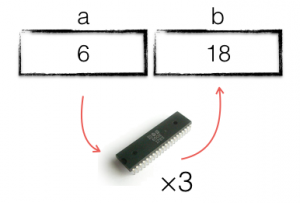 Computer memory, RAM, can be thought of as a sequence of boxes, placed one after another in a line. Each box, or cell, is labeled with a unique number, which increments sequentially; this is the address of the cell, its memory location. Each cell holds a single value. If you know the memory address of a cell, you can go to that cell and read its contents. You can place a value in that cell; replacing anything that was in there previously. That’s all there is to know about memory. Everything the CPU does is expressed as fetching and depositing values into memory cells. retrieve the value stored in address 200 and place it in the CPU. multiple the value stored in the CPU by 3.
deposit the value stored in the CPU into memory location 201. This is exactly how early programs were written; programmers would keep a list of memory locations, who used it, when, and what the value stored there represented. Obviously this was tedious and error prone, and meant every possible value stored in memory had to be assigned an address during the construction of the program. Worse, this arrangement made it difficult to allocate storage to variables dynamically as the program ran– just imagine if you had to write large programs using only global variables. To address this, the notion of a variable was created. A variable is just a convenient, alphanumeric pseudonym for a memory location; a label, or nickname. Retrieve the value stored in variable a and place it in the CPU. deposit the value into the variable b. This is the same program, with one crucial improvement–because we no longer need to talk about memory locations directly, we no longer need to keep track of them–that drudgery is left to the compiler. And the compiler will make sure that the variables a and b are assigned unique memory locations to hold their value for as long as needed. Now that we know that memory is just a series of numbered cells, and variables are just nicknames for a memory location assigned by the compiler, what is a pointer? 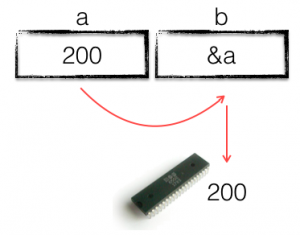 A pointer is a value that points to the memory address of another variable. 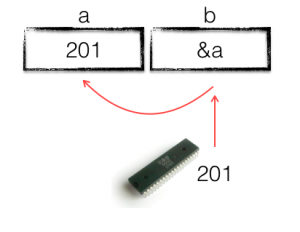 The pointer points to memory address of a variable, just as a variable represents the memory address of value. On the first line of main we declare a new variable a and assign it the value 200. Next we declare a variable b and assign it the address a. Remember that we don’t know the exact memory location where a is stored, but we can still store a‘s address in b. The third line is probably the most confusing, because of the strongly typed nature of Go. b contains the address of variable a, but we want to increment the value stored in a. To do this we must dereference b, follow the pointer from b to a. Then we add one the value, and store it back in the memory location stored in b. The final line prints the value of a, showing that it has increased to 201. This entry was posted in Go, Programming and tagged pointers on April 26, 2017 by Dave Cheney.